There’s something indefinable about this alien sheriff by Patrick Biggs that I can’t help but love. 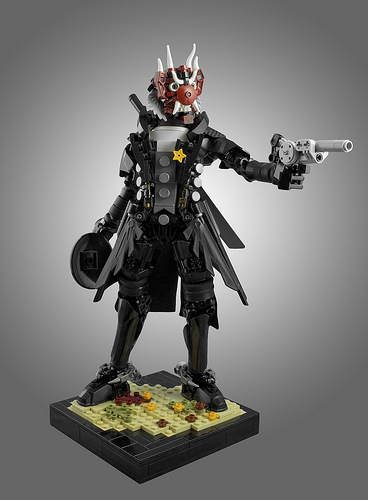 He wears the classic old-west sheriff attire–a long black coat with a dark gray waistcoat beneath–but it’s the small details that really bring this character to life, such as the spurs on the sheriff’s boots, his thumb poised on the hammer of his six-shooter, and the excellent sideburns constructed with light gray feathered wings, just to name a few. However, I think my favorite part about the build may be the simple use of a Friends star piece as the sheriff’s badge; in other words, using a star as… well… a star, showing that sometimes the perfect part is indeed out there, you just need to find it.